The oral, targeted synthetic DMARD (tsDMARD), JAK1 and JAK2 inhibitor baricitinib (Olumiant) is a novel small molecule that is approved in the EU and Japan for the treatment of adults with rheumatoid arthritis RA (moderate or severe active), who responded inadequately to (other treatments) or who were intolerant of C1 DMARD. JAK is a tyrosine kinase that plays crucial roles in cytokine receptor binding-triggered signal transduction activating the transcription factor signal transducers and activator of transcription (STAT). Activation of the receptor-bound JAKs is critical for initiating phosphorylation of the cytokine receptor and subsequent recruitment of one or more STATs. The phosphorylated STAT dimer is then actively and directly transported to the nucleus without involvement of any other kinases. The JAK family consists of four members: JAK1, JAK2, JAK3, and TYK2. More than 40 different cytokines and growth factors have been shown to activate specific combination of JAKs and STATs. Genetic knockout studies have shown that JAKs and STATs have highly specific functions in the control of various immune responses. 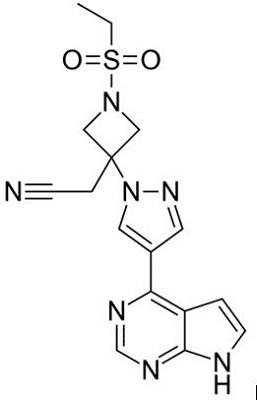 Baricitinib represents a selective inhibitor of JAKs with excellent potency and selectivity for JAK2 (IC50=5.7nM) and JAK1 (IC50=5.9nM), and less potency and selectivity for JAK3 (IC50 >400nM), or TYK2 (IC50=53nM). Although baricitinib potently inhibits JAKs, it does not significantly inhibit (<30% inhibition) a broad panel of 26 other kinases when tested at 200nM. It is indicated for the treatment of moderate to severe active rheumatoid arthritis in adult patients who have responded inadequately to, or who are intolerant to one or more disease-modifying anti-rheumatic drugs as monotherapy or in combination with methotrexate. Rheumatoid arthritis is a progressive autoimmune disease commonly associated with discomfort, disability, and joint damage. Throughout disease progression, the disease may further lead to joint erosions and deformities, causing premature mortality, functional impairment, and reduced quality of life. In the EU and Japan, oral baricitinib is approved (as monotherapy or in combination with methotrexate) for the treatment of adults with (moderate to severe active) RA who responded inadequately (to other treatments), or who were intolerant of C1 DMARD. The recommended dosage of baricitinib is 4 mg once daily; consideration may be given to a lower dosage of 2 mg once daily in patients who achieve sustained control of disease activity (with the higher dosage) and are eligible for dose tapering[3, 4]. The lower dosage is recommended for some patients, is appropriate for patients aged C75 years, and may also be appropriate for those with a history of chronic or recurrent infections. In patients with mild or moderate hepatic impairment, no dose adjustments are required; the use of baricitinib is not recommended in patients with severe hepatic impairment. Temporary or permanent discontinuation of baricitinib may be required for the management of AEs and laboratory abnormalities associated with baricitinib therapy[3, 4]. Local prescribing information should be consulted for further information, including contraindications, warnings, precautions, drug interactions and use in special patient populations. Baricitinib inhibits cytokine-induced STAT3 phosphorylation in whole blood from healthy subjects. Maximal inhibition was observed at approximately 1-2 hours post dose and corresponds with the maximum observed plasma concentration (Cmax) blood levels. Mean absolute neutrophil count decreased in a dose related manner reaching a nadir at 8 hours following dosing and returning to baseline 16-24 hours post-dose. In the multiple dose study, neutrophil count return to baseline within 24 hours following the final dose of study medication on Day 10 or Day 28 of repeat dosing. On the other hand, mean absolute lymphocyte count tended to increase peaking 6 hours after dosing and returning toward normal by 24 hours after dosing. Transient increases of absolute lymphocyte count reversed by 24 hours in the 10-day and 28-day repeat dose studies. In the phase 3 studies for RA, increase in T cells, B cells, and NK cells were seen at week 4, while decreased T cells and NK cells and increased B cells were seen at week 12 and 24 in patients taking baricitinib. These changes were generally within normal ranges. Decreased NK cell count did not appear to be associated with an increased incidence of infection. In vitro, baricitinib demonstrates excellent potency in cell-based assays. Baricitinib inhibited IL-6 stimulated phosphorylation of STAT3 and subsequent production of MCP-1 with IC50 value of 44nM and 40nM, respectively in PBMC. This effect was not due to general cytotoxicity. Baricitinib also potently inhibited the phosphorylation of STAT proteins and the production of pathogenic cytokines such as IL-17 and IL-22 in T cells. In our experiments, both IFN-α and IL-6 induced phosphorylation of STAT1, STAT3 and STAT4 in human CD4+ T cells. IL-12 induced phosphorylation of STAT4. IL-21 induced phosphorylation of STAT3 and STAT4. Baricitinib inhibited the phosphorylation of STAT1, STAT3 and STAT4 induced by IFN-α, IL-6, IL-12 and IL-21. In RA-BEACON study, which enrolled 527 adult patients with moderately to severely active RA who have had an insufficient response to or are intolerant to at least 1 biologic TNF-α inhibitor and were taking background csDMARD therapy, more patients experienced treatment emergent adverse event (TEAE) in the baricitinib groups compared to placebo. Adverse event-ratio through 24 weeks was higher for patients receiving the 2 mg dose (71%) of baricitinib and those receiving the 4 mg dose (77%) than for patients receiving placebo (64%), including infections (44% and 40%, vs. 31%). Mild or moderate, non-serious infections of the upper respiratory tract appeared to contribute substantially to any imbalance. These events were also associated with an increase in brief, temporary interruptions of study drug in the baricitinib groups. The rates of serious adverse events (SAE) were 4%, 10%, and 7% in the three groups, respectively. The proportions of patients with an SAE were similar across treatment groups. Few malignancies were seen; 2 non-melanoma skin cancers in the baricitinib 4 mg group, with no solid organ, hematologic, or other malignancies reported. Two positively adjudicated treatment-emergent major adverse cardiovascular events (MACE) occurred: 1 myocardial infarction (baricitinib 4 mg) and 1 basilar artery thrombosis (baricitinib 4 mg) that was also the only death during the study. No patient experienced a gastrointestinal perforation. Baricitinib was associated with a small reduction in neutrophil levels and increases in serum creatinine and LDL cholesterol levels. Very few patients permanently discontinued study drug as a result of a treatment emergent laboratory abnormality in the baricitinib groups. Shi JG, Chen X, Lee F, et al. The pharmacokinetics, pharmacodynamics, and safety of baricitinib, an oral JAK 1/2 inhibitor, in healthy volunteers. J Clin Pharmacol. 2014; 54(12):1354–61. Two new drugs for rheumatoid arthritis. Drug Ther Bull. 2017;55(9):102–5. European Medicines Agency. Olumiant (baricitinib) film-coated tablets: EU summary of product characteristics. 2017. http://www.ema.europa.eu/. Eli Lilly. Olumiant (baricitinib): Japanese prescribing information 2017. https://www.pmda.go.jp. O'Shea JJ, Plenge R. JAK and STAT signaling molecules in immunoregulation and immune-mediated disease. Immunity. 2012; 36(4):542-550. Darnell JE, Jr., Kerr IM, Stark GR. Jak-STAT pathways and transcriptional activation in response to IFNs and other extracellular signaling proteins. Science. 1994; 264(5164):1415-1421. Fridman J, Scherle P, Collins R et al. Selective inhibition of JAK1 and JAK2 is efficacious in rodent models of arthritis: preclinical characterization of INCB028050. J Immunol. 2010; 184(9): 5298-5307. Ni H, Moe S, Myint KT, Htet A: Oral janus kinase inhibitor for the treatment of rheumatoid arthritis: to facitinib. ISRN Rheumatol. 2013 Jul 21;2013:357904. doi: 10.1155/2013/357904. eCollection 2013. Fridman J, Scherle P, Collins R et al. Selective inhibition of JAK1 and JAK2 is efficacious in rodent models of arthritis: preclinical characterization of INCB028050. J Immunol. 2010;184(9):5298-5307. Shi JG, Chen X, Lee F et al. The pharmacokinetics, pharmacodynamics, and safety of baricitinib, an oral JAK 1/2 inhibitor, in healthy volunteers. J Clin Pharmacol. 2014;54(12):1354-1361. Posada MM, Cannady EA, Payne CD, et al. Prediction of transporter- mediated drug–drug interactions for baricitinib. Clin Transl Sci. 2017;10(6):509–19. van Der Heijde D, Schiff M, Tanaka Y, et al. Low rates of radiographic progression of structural joint damage over 2 years of baricitinib treatment in patients with rheumatoid arthritis[abstract no. FRI0087]. Ann Rheum Dis. 2017;76(Suppl 2):510–1. 1187594-09-7 US $1.00 / kg 1kg 99% 20tons Hebei Jimi Trading Co., Ltd.
1187594-09-7 US $10.00 / KG 1KG 99% 500ton/month Hebei Chisure Biotechnology Co., Ltd.